Long, long – the Ryogoku Bridge is long. on the long Ryogoku Bridge, oh! and to hear the musicians and the reciters! How pleasant it was, how pleasant! 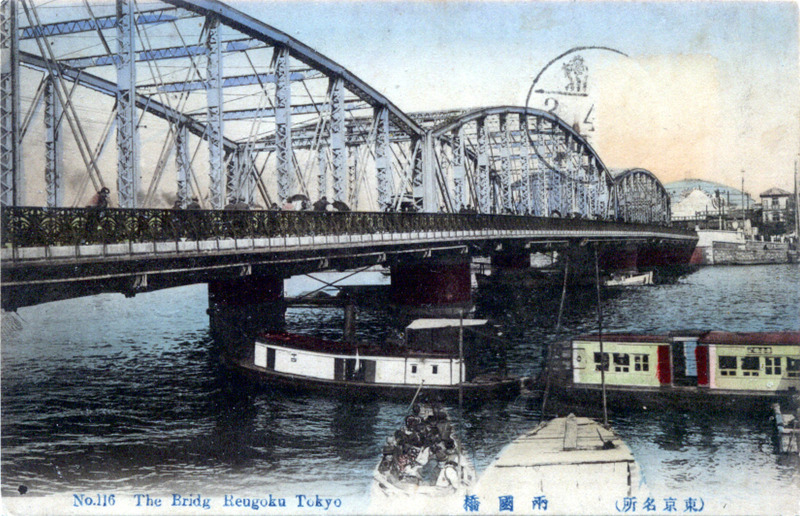 A pleasure-boat passes beneath the Ryogoku Bridge, c. 1910. In the distance can be seen the dome of Kokugikan, the National Sport (Sumo) Hall. “The most famous of the Meiji Sumida bridges and the widest (24.5 meters) was Ryogokubashi, a three-span steel truss finished in 1904. The middle bridge of the river, it was a heavily used crossing and also the best place to view the fireworks at the traditional summer ceremony ‘opening the river,’ an occasion marked since the end of Edo by festive drinking and singing along the banks and on the water. 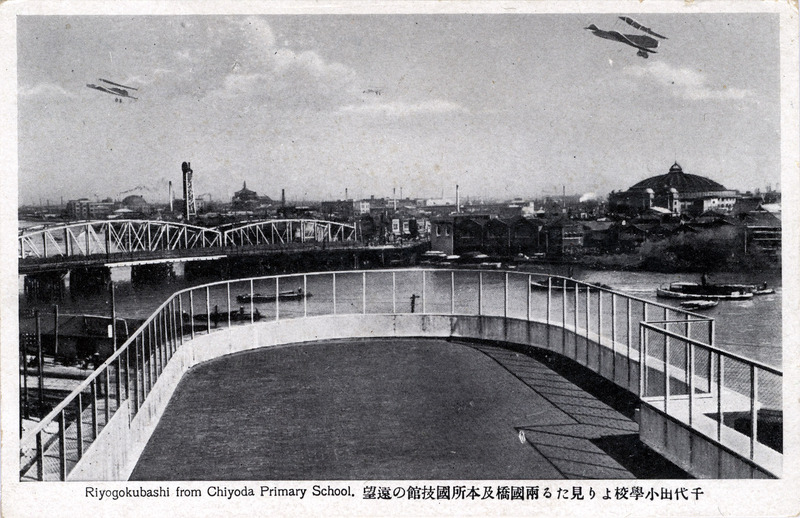 Ryogokubashi and Kokugikan (left), with aeroplanes, c. 1920. 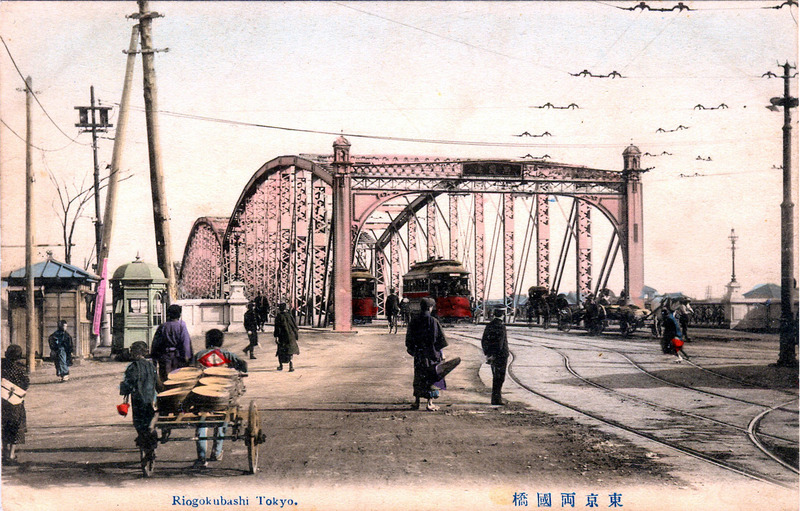 Ryogoku Bridge, c. 1910, looking west. 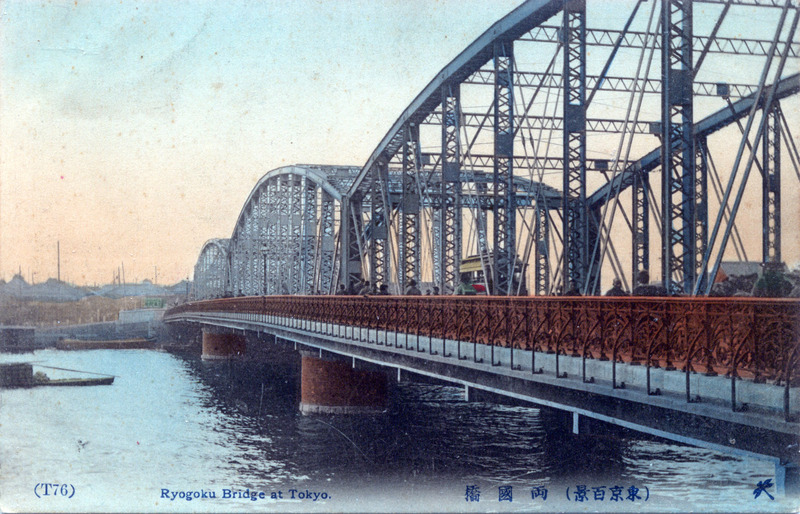 Ryogoku Bridge, c. 1910, looking east. Elevated view of Ryogoku Bridge, c. 1910, with Kokugikan in the distance. 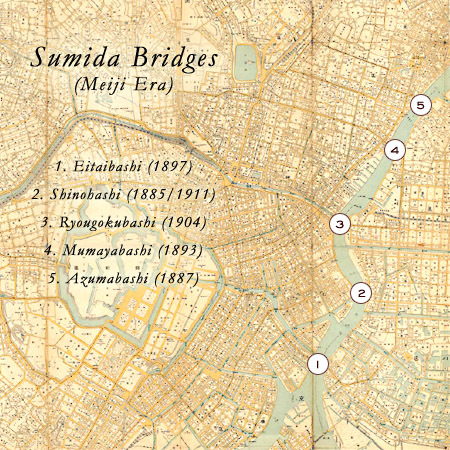 Map: Sumida River bridges (Meiji Era). 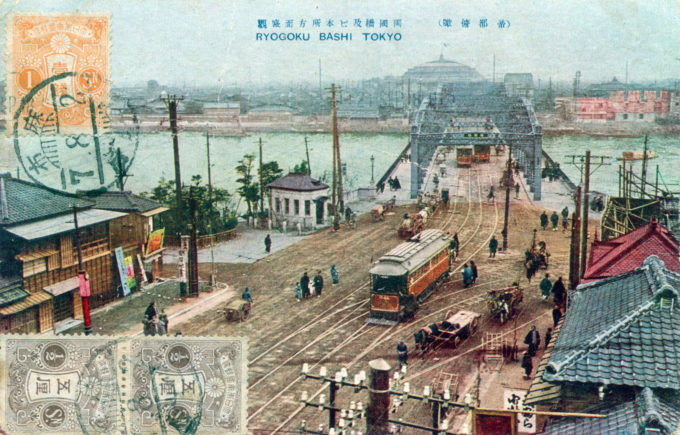 The rather unusual name, Ryogoku-bashi [two countries bridge], came about because, in the early Edo era, the west bank of the Sumida was located in Musashi province; the east bank was located in less-developed Shimosa province. The Ryogoku bridge was the first of three Edo-era to span the Sumida River, first erected in 1659 of wood across the river near its confluence with the Kanda River two years after the devastating Meireki [Long sleeves] Fire. This effectively annexed the east side of the river, considered to be a less incendiary district, into Edo for the development and expansion of Shitamachi [the Low City] with the construction of docks and storage yards. The modern-era iron truss span was completed in 1904. Destroyed in the 1923 earthquake, the present-day steel span at Ryogoku spanning the Sumida river was completed in 1932.